When we cut the cord on our cable plan a few years ago, Sling TV was one of the first streaming services we tried. While Sling TV packages have changed some since then, the fact that they offer a solid lineup of the most popular channels at a reasonable monthly cost has stayed the same. This could be the year that you finally cut your overpriced cable bill. You’ve taken an important first step by considering Sling TV. Here, we breakdown the Sling TV channel lineup for you, including exactly what Sling TV channels are available. We also cover what Sling TV packages cost and what Sling TV local channels you can get so that you can choose the Sling TV package that’s best for you. A low monthly cost is what makes Sling TV one of the most popular cable alternatives out there. For just $25 per month, you can choose a Sling TV channel lineup with the shows that matter most to you. We’ll dive into the Sling Orange channel list, Sling Blue channel list and Sling Orange + Blue channel list momentarily. But first, if you still have cable, think about what it’s costing you. What could you do with an extra $80 per month? The average cable bill is $110 per month. Choosing any of the three Sling TV packages available slashes that cost considerably, which makes Sling TV one of the best cord cutting solutions. Want to know more about Sling TV before diving into the Sling TV channel guide? Read our Sling TV review for our honest take on the cost, channels, device compatibility, menu and more and decide whether this over the top (OTT) service is right for you. What makes Sling TV unique is that it offers two main channel packages: Sling TV Orange and Sling TV Blue. While some popular channels, like A&E and CNN, are in both Sling TV packages, other important ones, like ESPN and FS1, are not. Sling TV also bundles both Orange and Blue into one channel package. This gives you access to all of its channels for a lower price ($40) than buying both Sling TV packages separately, which would cost $50. Of all the programming available on Sling TV Orange channels, there is one channel that people look for more than any other – ESPN. When it comes to ways to watch ESPN without cable, it’s important to note that with Sling TV there are only two ways to get ESPN (as well as ESPN2 and ESPN3) – with Sling TV Orange or Sling TV Orange + Blue. The Sling TV Orange Channel list comes with more than 30 channels, including AMC, CNN, ESPN, Food Network, and TBS. As you can see, the Sling TV Orange channel lineup offers a good variety of content from news to sports to lifestyle and entertainment channels as well as programming for kids. For example, Disney Channel is part of Sling TV Orange. One drawback of the Sling Orange plan is that it only allows you to watch content on one screen at a time. Other plans allow you to use Sling TV on up to three or four screens at once, so if that’s important to you, you may want to opt for the Sling Blue or Sling Orange + Blue plan. Again, what sets the Orange channel package apart is the ESPN channels it offers. While ESPN is missing from the Sling TV Blue channel lineup, the other sports and lifestyle channels included make up for it. Not only will you enjoy FOX, FOX Sports, FS1 and FS2, you’ll also get NBC Sports Network and the NFL Network, making the Blue channel package a good option for sports fans. Another highlight of Sling Blue is that it allows you to watch TV on up to three screens at a time. For example, this means you can watch sports on your TV while someone else watches HGTV on a laptop and yet another person watches cartoons on a tablet. As you can see, on top of sports channels, the Sling TV Blue package also offers more lifestyle and entertainment content from BET, Bravo, Discovery Channel, FX, Nat Geo, Nick Jr, TLC, and USA. If you can live without ESPN, the Blue lineup provides a solid choice of major cable networks across news, entertainment, sports and lifestyle TV at an incredibly reasonable cost. The Sling Orange + Blue channel package is one of the things that makes Sling TV unique. If you want all the Sling TV channels and you want to watch on up to four screens or devices at a time, this package is the best choice for you. If you’re not sure which channel package is best for you, try Sling TV free for 7 days and choose the Orange + Blue channel package. See which channels you watch most during the trial and then pick the package that contains all or most of them. *Note: when you start your free trial, Sling TV will ask you to combine the Blue and Orange channels in your guide to avoid duplicate entries. Do this or you’ll be confused when you search for programs to watch. Sling TV tries hard to offer an a la carte TV experience. 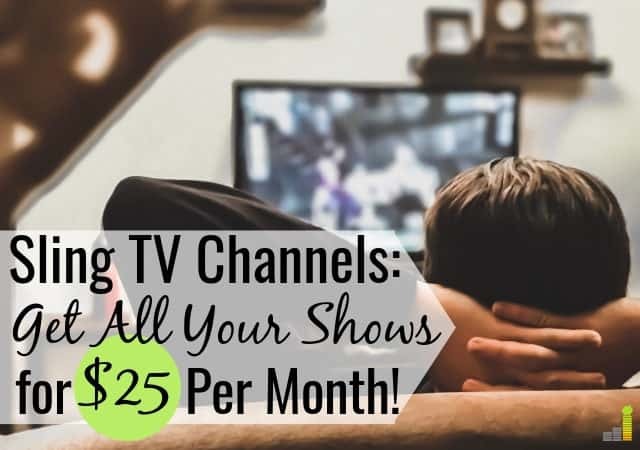 They do this by offering a well rounded selection of the most popular channels in their base packages and then offering ‘extras’ that you can add on for an additional monthly fee to get the exact content you watch most. Not only does this make Sling TV different from other streaming providers, it’s also very different from the cable TV approach, which bundles everything together at a higher monthly cost. While this might be more convenient when you’re signing up, it’s more expensive and it usually ends up in causing you to scroll endlessly through dozens of channels you never watch. With Sling TV, you can customize your TV to the content you enjoy most with 10 extras packages. The extra channels available vary depending whether you have Sling Blue or Sling Orange. The best thing about Sling’s extra channel packages is that they all cost just $5 per month. If there’s something you really want to see that isn’t in your Orange or Blue package, you can add it on and keep your overall monthly cost well below the average cable bill. If you enjoy premium channels, you don’t need cable to get them. Sling TV lets you easily add them on to your base package for an extra monthly fee. Sling TV does offer local channels, with a few catches. First, you have to live in the right place. FOX and NBC are included in Sling Blue on demand and live in select markets. Depending on where you live, you might be able to get ABC and CBS thrown in to whatever plan you choose for free. If local channels are important to you, the best option is to buy a digital antenna. After you buy the antenna, all the local channels in your area are yours, free. We bought a Mohu Leaf on Amazon a few years ago and love it. Yes, Sling TV offers a cloud DVR service for an extra $5 per month. The DVR option lets you record and watch live TV anytime on your devices as well as your TV. It also lets you fast forward through commercials and keep your recorded programs for as long as you are a Sling TV customer. Another bonus is that you can record multiple shows at once. 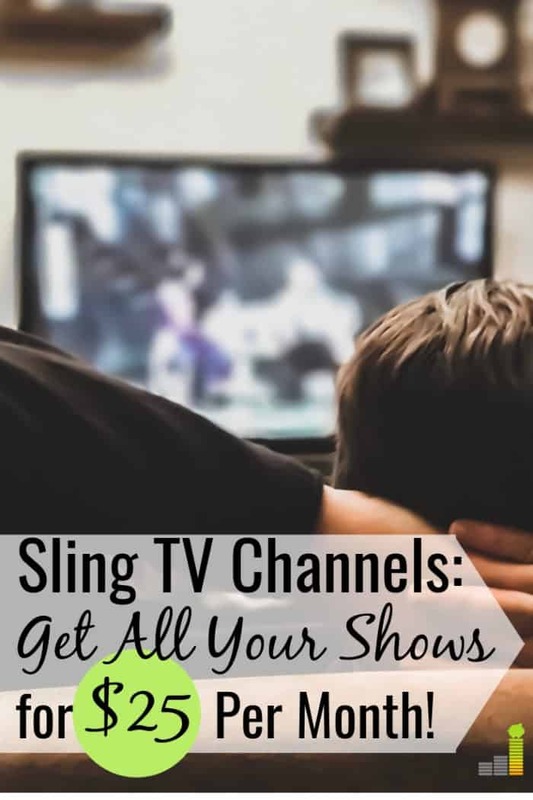 You can record up to 50 hours of programming and Sling makes it easy to set up and manage your recordings through the ‘My TV’ portion of its channel guide. Sling TV is supported by a large number of devices and platforms, including all the major ones. Whether you want to watch on your phone, tablet, computer or TV, chances are excellent that you can watch live TV as well as recorded programming (if you choose the cloud DVR option) with Sling TV on your favorite device. If you don’t see your device listed, check Sling TV’s website for more details. While we’ve already answered the question of ‘what channels do you get with Sling TV?’ you may have other questions you want answered before you take a chance on Sling TV. Here are some of the most common questions about Sling TV our readers ask. How fast does my internet need to be to stream Sling TV? Sling TV is best enjoyed at an internet connection of 5.0 megabits per second (Mbps) or higher. Ideally, 25 Mbps or more is best. If you’re watching on a tablet or phone, you can get away with slightly lower speeds. Will I get major networks on Sling TV? Sling TV offers limited programming from FOX and NBC. As mentioned earlier, you might be able to get ABC and CBS as well depending on where you live. If watching ABC, CBS, FOX, and NBC are important to you, the cheapest way to get them is with a digital antenna. The Mohu Leaf is one good option which sells on Amazon for under $50. Yes. Expect it to be similar to cable TV. If you choose Sling TV’s cloud DVR option though, you can fast forward through commercials on programs you’ve recorded. Do Sling TV channels include on-demand content? Sling TV is different from Netflix. While there is on-demand content, there is also live TV. The amount of on-demand content varies and can come and go without notice. The good thing is that all Sling TV channel packages include free on-demand programming. How many devices can I stream Sling TV on at once? The answer depends on your plan. Sling Orange lets you watch on only one screen at a time. Sling Blue lets you watch on up to three screens (or devices) at a time. Sling Orange + Blue lets you stream on up to four devices at once. After breaking down all of the channels and add-ons Sling TV offers, one important question remains – is Sling TV worth it? If you want to cut the cord, Sling TV is a solid choice. If you want to slash your cable bill and still be able to watch ESPN or watch HGTV without cable, it’s worth $25 per month. You can always cancel any time without any fees since there’s no contract. Depending on what matters most to you (i.e. ESPN or FOX vs. USA and Bravo), you can find it in one of Sling TV’s channel packages. Sling TV makes it easy to customize your experience further with affordable extras that run only $5 per month. If you’re paying $110 or more per month on cable, a switch to Sling TV will instantly save you $85 per month or more. If you decide to give Sling TV a try, take advantage of their 7-day free trial. Sign up for the Orange + Blue package and see which channels you watch most. The free trial is a risk-free way to explore their platform and see if it is a good fit for you. Do you still have cable or have you already cut the cord? If you have cable, how much are you paying for it each month? What’s one channel you feel like that you can’t live without? If you’ve used Sling, what do you think of it? Would you recommend it to others? So, if I have both orange and blue and I added the sports package for $5.00 more a month I would get everything listed in both orange an blue columns, correct? Yes, that’s correct Terry. It’d give you all of the base channels they offer plus everything in the sports package.